We offer a range of bridal packages including bridal makeup services, hair styling services, facial services, pedicure services, and manicure services. Our bridal packages and services are exclusively designed for bridal beauty needs. Our services are administrated by top bridal makeup artists and so we ensure to make the bride stunning at her big day. Every bride is beautiful and there are two reasons, one is the glow of happiness and another reason is the makeup. It is the desire of every bride to look the best on her wedding, after all, it is her day. She has the full right to give direct competition to the moon with her beauty as everything in the occasion glorifies her prettiness. We at Studio99 brush up the prettiness of the bride and help her to live her dream to look like a princess on her wedding day. The wedding is a once in a lifetime affair and is supposed to be perfect in every sense. When it comes to the attraction of the event then definitely the eyes roll out when the bride walks down the aisle. The beauty of the bride is really the most admirable thing on the event and considering the significance of the same, our experts are there to give her the gorgeous look of the event. At Studio99 we have the qualified and experienced staffs which present the perfect blend of western and traditional styling for bridal makeup. 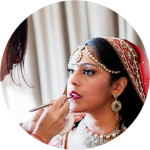 We specialize in three bridal makeup keys namely the classic South Indian bride, the Bollywood inspired North Indian bride and the elegant Christian bride. It is the endeavor of our beauty experts to provide the best makeup to the bride, which goes up well with her attire, the time of the day and also her personality. The perfect blend of makeup makes her live her fairy-tale wedding. So, you are planning a destination wedding. Don’t worry because Studio99 will go with the bride-to-be wherever in this world she wants to take the vows of the wedding. On special request, we provide outstation services for makeup and hairstyles for destination weddings. 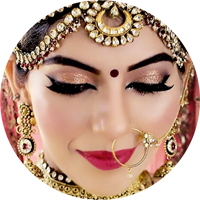 Studio99 provides outdoor wedding makeup, wedding hairstyle, Mehandi, photography, videography, and Saree draping services for the bride on her special day. On request, the outdoor bridal services can be availed from Studio99. Of course, wedding is a one-day affair but for the bride, it is a panic and preparation of 6 months. As she needs to look the most beautiful amongst all, hence she gets indulged in grooming many months prior. For this much-desired act, we provide pre-wedding bridal package and wedding packages. We provide bridal packages that beautify bride inside and out. From a miracle 3 months pre-bridal luxury package that covers facial sittings, body massage, skin lightening procedures, body, and hair spa to one-month exclusive bridal package, we have the most soothing options for the bride-to-be to make her look gorgeous on her big day. We also have wedding packages for grooms. 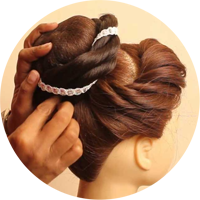 Hairstyling changes the complete look of a person and when it comes to bridal hairstyle then no risk should be taken. Whatever is your hair type, whether you have long hairs, short hairs, straight hairs, frizzy hairs or silky hairs, you can easily rely on our experts as they would do the best with your hairs to make it the perfect complement with your beauty and attire. From hair cutting to hair color and to professional hair spa and other required hair treatments, we have experts who are skilled in providing the best look to your hair without any damage. To make every bride look picture perfect, our experts craft the hairstyle which is the perfect blend of traditional style and modern look. To complement the attires of the bride in the most beautiful way, a perfect makeup is required and this is for what we are committed for at Studio99. Whether it is the perfect matte finish lips or smoky eyes, a perfect makeup can only complete the perfect bridal look. We have the experts, who provide the perfect makeup depending on the bride’s outfit, physical feature, and the time of the party. The perfect blend of perfect comes out in the form of an elegant bride makeup every time. 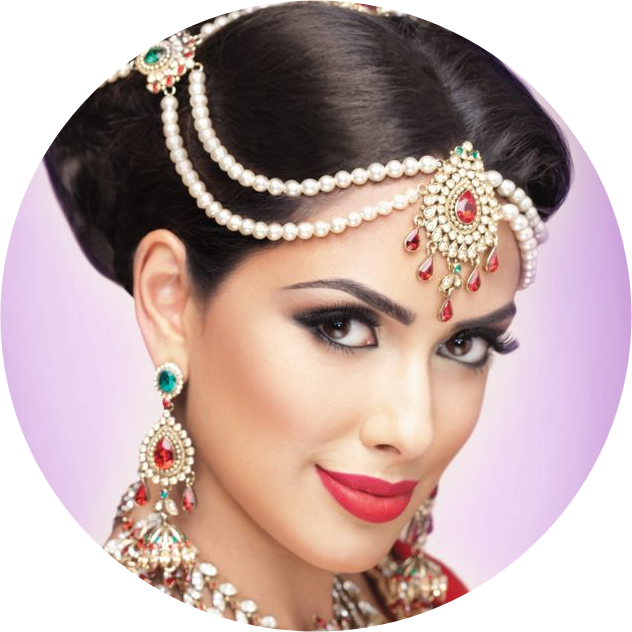 From traditional to Bollywood, whatever is your desire, at Studio99 we have the top class makeup artist to turn your dreams into reality regarding your perfect wedding makeup. Every girl wants to her look to be the prettiest on her wedding day. There are movies that inspire girls to opt for Bollywood makeup styles. 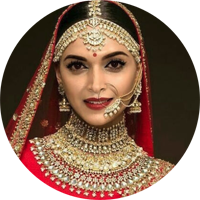 Be it wedding attire or wedding makeup, there is a huge influence of Indian actresses on brides. We at Studio99 offer Bollywood style makeup and makeover services to match your needs of Bollywood style makeup and hairstyling.